Delegates and officials from around Asia and the Pacific gather in Bangkok, Thailand for the opening of the 73rd Session of the Economic and Social Commission for Asia and the Pacific (ESCAP). Asian and Pacific countries are discussing economic cooperation and integration this week at the United Nations regional office in Bangkok, whose annual session focuses on how regional countries can achieve the Sustainable Development Goals (SDGs). Welcoming senior officials to the 73rd Session of the UN Economic and Social Commission for Asia and the Pacific (ESCAP), Executive Secretary Shamshad Akhtar shared key achievements made in the past year in support of the SDGs, the global goals set out in the UN 2030 Agenda. “Together with you, we have made considerable progress in formulating strategies that seek to eradicate poverty and ensure that development balances the needs of economy, people and planet,” Ms. Akhtar told heads of Government and other high-level officials from Asia and the Pacific. During the week-long session, participants will review and endorse a number of resolutions and policies, including a regional plan for implementing the SDGs. The plan – known as the Regional Road Map for Implementing the 2030 Agenda – sets out priorities for regional cooperation, calls for enhanced technical cooperation on areas such as disaster risk reduction and climate change, and discusses data and statistics, and other means of implementing the SDGs. In addition, ESCAP is developing a regional resource facility on the SDGs, which will include analytical reports and online capacity building tools to teach policy makers and others about issues related to the SDGs. 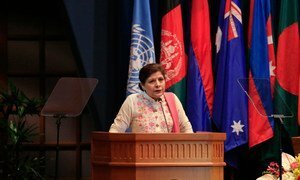 “This is expected to be one of the key mechanisms to promote South-South, North-South and triangular cooperation on the 2030 Agenda in the Asia-Pacific,” said Ms. Akhtar. In a video message to the Commission, Secretary-General António Guterres lauded ESCAP for its efforts to reduce poverty, protect the environment and help to realize the 2030 Agenda. “Your spirit of openness and willingness to work beyond borders is critical to enhancing multilateralism,” the Secretary-General said. Among the topics to be discussed this week is regional cooperation for sustainable energy in the region, which is a special theme of this year’s meeting. In her speech, Ms. Akhtar said ESCAP’s flagship study, which will be presented on Friday to high-level officials but is now available online, recommends developing a regional cooperation framework on sustainable energy to enable Governments to identify ways to transition its energy uses to more sustainable methods. Notwithstanding the challenges faced by countries in Asia and Pacific, the region has witnessed economic and social achievements beyond expectations over the past 70 years, according to the head of the United Nations body assisting with development efforts.